Welcome to Day #4 of Zucchini Week. I don’t want it to ever end, but sadly we’re winding down. Before I share the recipe deets with you, I wanted to remind you that we’ll have a bonus zucchini recipe heading to your inboxes if you subscribe to Ambitious Kitchen’s newsletter. If you don’t, you can do so here! Now onto ze ballz. DEZ BALLS. To be honest with you, chicken (or turkey) meatballs or meatloaf is on my menu once a week in our house. WE LOVE IT. It’s an easy dinner; just serve veggies or a salad on the side for a high protein, nutritious meal. 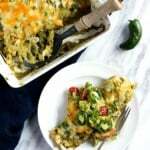 For day 4 of zucchini week, I wanted to give you another easy one pan meal that would be awesome for meal prep, for when you don’t feel like creating a huge mess in your kitchen or have zero time (so this is basically all of you). And honestly, I’m just gonna say this: I freakin’ nailed it. Yep, tooting my own horn over here. TOOT TOOT. 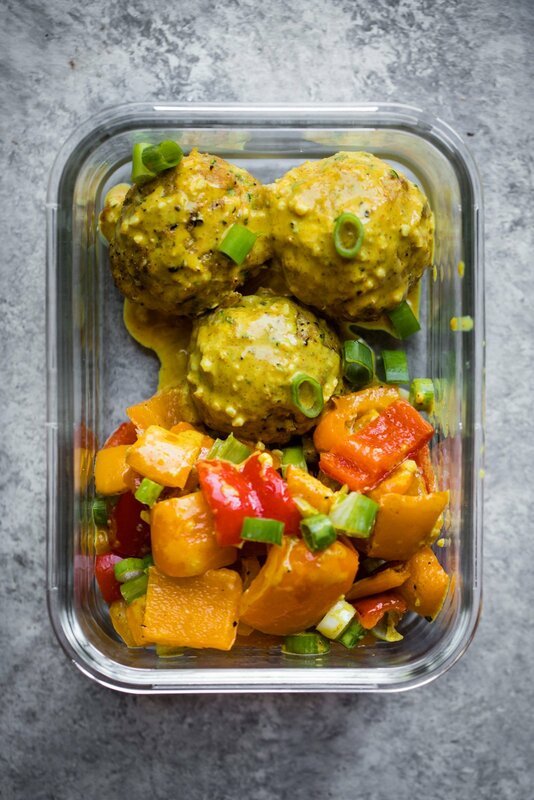 These lean chicken (or turkey) meatballs are SO juicy and flavorful thanks to shredded zucchini, curry powder, turmeric, garlic and more. Just roll them up into big golf sized balls, place on a baking sheet with the chopped bell peppers and bake away! 20 minutes later you have an absolutely delicious healthy meal to nosh on. Of course, I can’t forget this coconut curry sauce situation. This may be a little dramatic, but I kind of want to bathe in it (that’s how addicting it is). It’s made with coconut milk, tahini, garlic, curry powder, turmeric, cayenne, ginger and just a touch of maple syrup. If you’re a curry fan, be prepared to fall in love! 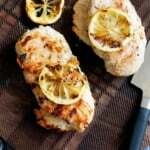 This recipe make AMAZING leftovers, is lower in carbs, packs in a ton of protein per serving and is wonderful for meal prep. Just make ahead and bake, allow to cool, then place three meatballs and peppers in a meal prep container. I do recommend serving this week a baked sweet potato, quinoa or rice — you can drizzle the sauce on top of everything. Once ready to eat, microwave on high for 1-2 minutes until warm. I have a feeling this is a recipe you’ll be making again and again. Enjoy — xo! 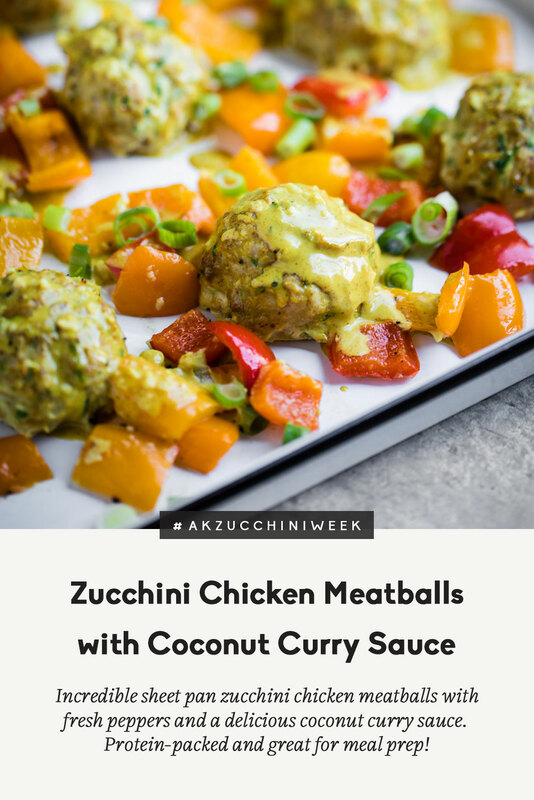 If you make these zucchini chicken meatballs, don’t forget to leave a comment and rate the recipe below. And of course, if you have Instagram, we’d love to see your creations — don’t forget to tag #ambitiouskitchen! You can also join our AK Facebook community group here. 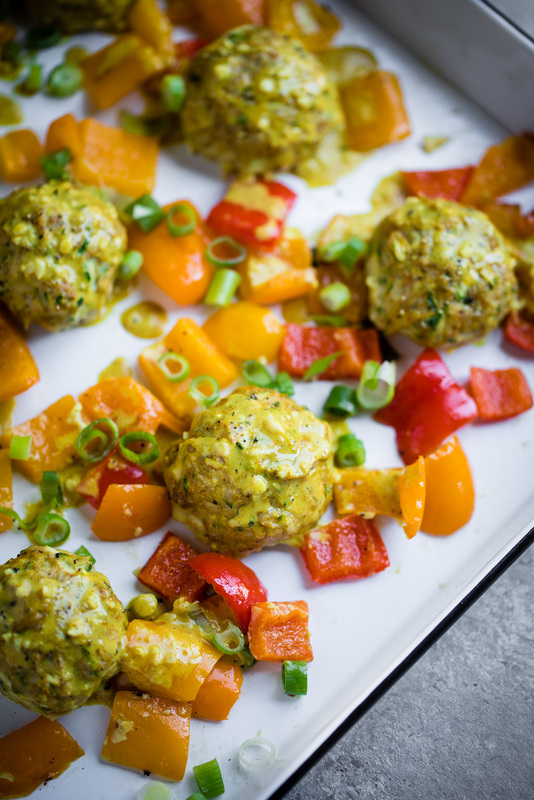 Sheet pan zucchini chicken meatballs with gorgeous bell peppers and a flavorful coconut curry sauce. 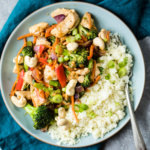 This easy, delicious recipe is packed with protein and great for meal prep! Preheat oven to 400 degrees F. Line a large baking sheet with parchment paper. If you don't have a large baking sheet, you can use two smaller pans. Add chopped bell peppers to a medium bowl. Drizzle with olive oil, then sprinkle on garlic powder and a little salt and pepper. Use a spoon to toss the peppers in the oil to coat them. Set aside. Make the meatballs: Add ground chicken (or turkey), shredded zucchini (make sure you squeezed all the excess moisture out) , breadcrumbs*, egg, minced garlic, curry powder, cumin, turmeric, cayenne, salt and pepper to a large bowl. Use clean hands to mix until well combined. Do not over mix. Grab a golf size ball of meat and roll it into a ball. Place each on baking sheet, about 2 inches apart. Evenly distribute chopped bell peppers in the spaces between the meatballs like the pictures show. Bake for 20-25 minutes or until meatballs are fully cooked and a meat thermometer reaches 165 degrees. Mine were done at 20 minutes. While the meatballs are cooking, make the coconut curry sauce: In a small bowl, whisk together the coconut milk, tahini, garlic, maple syrup, curry powder, ginger, turmeric, cayenne and salt and pepper, to taste. Be careful to not over salt the sauce -- taste and adjust as you go. Drizzle sauce over cooked meatballs. Garnish with green onion and cilantro, if desired. Serves 4, 3 meatballs each + roasted peppers + sauce. To make this a full meal, I recommend serving with rice, a baked sweet potato or quinoa. To make meatballs GF or paleo: I recommend using gluten free breadcrumbs or you can sub 1 tablespoon coconut flour (for the 1/4 cup breadcrumbs). 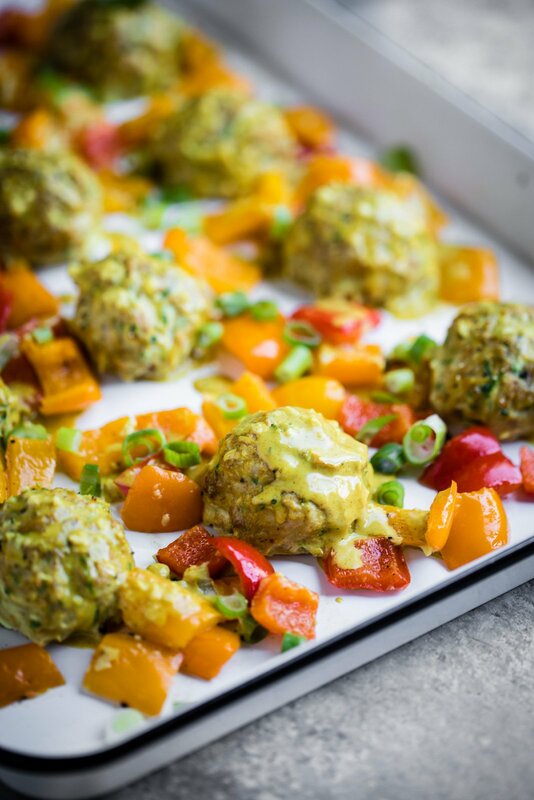 54 Responses to "Sheet Pan Zucchini Chicken Meatballs with Coconut Curry Sauce"
This recipe sounds SO tasty! I am all over that sauce! Adding shredded zucchini to meatballs, taquitos, etc is my jam as well! Could I use peanut butter instead of tahini? I have everything besides tahini! And these look scrumptious! 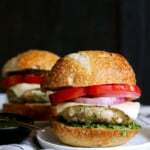 Will be happy to receive your recipes & thanks. YUM! Just had a taste. Lunches for the week solved once again by Monique! Perfect weekday lunch!! Love it. This is an amazing recipe. I was trying it out for myself and ate the entire pan. Meatballs are really moist and the garlic and spices are wonderful. Pairing this with roasted bell pepper is a clever taste combo. I love the heat from the cayenne, but I think for most of my friends I’d have to leave that out. Next time I’ll probably make the meatballs a little smaller. For the sauce I didn’t have ginger and didn’t feel like dealing with more garlic, so I left those out. For company I’d consider individual bowls of rice and serving this on top. Wish I could think of something to do with the leftover coconut milk. This does involve some focused kitchen prep time, so if I was fixing this as an after work dinner with friends I think one could get everything ready the night before and pop into the oven while you get the rice cooking. I’m so glad you liked this one! It’s perfect for customizing for friends + family, too. These would be delicious with rice! This recipe is amazing!!! Followed it exactly but doubled the sauce. Such an easy week night dinner! Love it! That sauce is the BEST. Made these last night. Major yum!! Served over cauliflower rice, added a bit more salt. Will definitely make again! Perfect!! 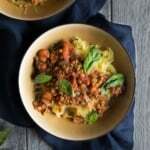 Love the idea of cauliflower rice with this. Yum! My two and a half year old daughter helped me prep the meal (tossing peppers into bowl, dumping spices, placing meatballs on pan). Delicious and fun activity for us 😁 this recipe is a keeper! 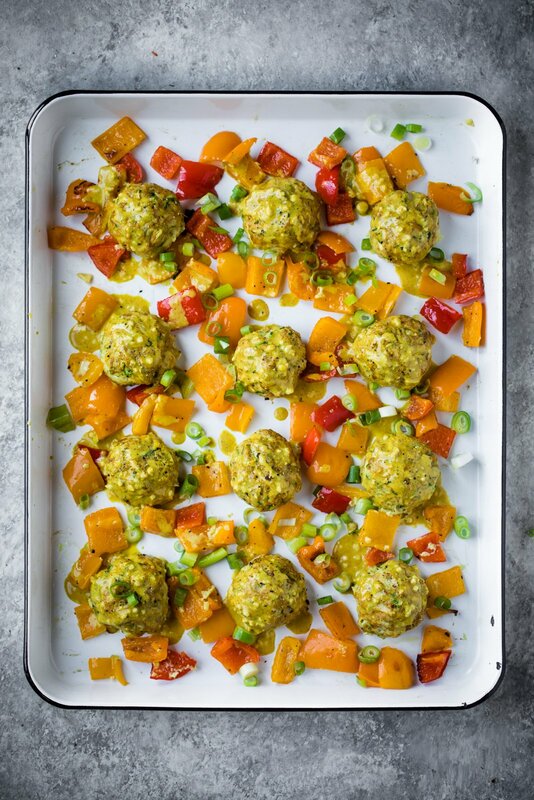 Love the addition of a curry sauce – such a creative spin on meatballs and so much color/flavor! I made this last night for dinner and my boyfriend LOVED it. I haven’t seen him grab seconds in a LONG time, so I thought I would pop back in and say, thank you! We enjoyed it immensely! Amazing!! So happy to hear that 🙂 My husband loves this one too! Those meatballs look amazing and I’m LOVING the sound of that sauce!! I am totally going to make these! How do you shred the zuchinni for this recipe? I use a hand grater like this one! Actually sheet pan zucchini chicken is wonderful. So good! Made these with turkey and they came out amazing! made them like 3 times already! I made these tonight and they are amazing! No lack of flavor here and so moist. Absolutely making them again! So happy to hear that! Perfect weeknight dinner. Wow, this was incredible! Probably the first recipe I’ve found in several months that truly left me wowed. I never realized how much I liked peppers until stirring them into basmati rice with this delicious sauce, which I’m glad I doubled. I used 85% lean turkey for the meatballs and they turned out so moist thanks to the zucchini. I would love to know if you’ve tried that meatball recipe for Italian style dishes and swapped out the spices or if you have any suggestions for doing so? Husband was begging to have them with spaghetti in the near future! This is such a delicious recipe and came together quickly. Love the flavors and the colors. Thanks for the recipe! This was my first attempt at making meatballs, and they turned out great – a fabulous recipe! I doubled the sauce recipe, because I love me some sauce! OMG made these tonight and it is now one of my favorite recipes ever. 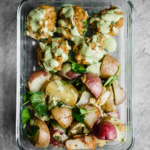 I love Whole Foods chicken and quinoa meatballs from the hot bar but these are BETTER. Absolutely delicious. My boyfriend actually asked to take the leftovers for lunch tomorrow…Lol. You hit it out of the park with this meal! Amazing!! So happy to hear that Morgan! Just made this tonight and my kids and I loved it! I used a whole can of coconut milk and adjusted the other sauce ingredients accordingly. We loved the sauce so it worked out well! My toddler kept spooning it into her mouth as “soup!” Amazing meal. We will definitely make this one again! 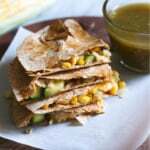 I love this recipe and have added it to my usual dinner rotation. The combination of the meatballs + sauce is so delicious! I usually have a baked sweet potato on the side.